Which Are The Best Cordless Combi Drills? For this review, we have tested 5 of the best cordless combi drills from leading brands such as Bosch, Ryobi and Black & Decker. Bringing you our recommendation for the best cordless combi drills on the market. When choosing equipment to review, we made a conscious decision to only include combi drills that came as a kit with 2 batteries. We decided on this as it is often cheaper to purchase as part of a kit than to pick up additional batteries later. A second battery also doubles the endurance of the drill and helps you to get your DIY jobs done with less waiting around for your batteries to charge. We will always give fair and impartial advice as part of our reviews. We always highlight the positives of a product and any negatives that we can see when we review them. So which are the best cordless combi drills? Let’s have a look. Why would I need one of the best cordless combi drills? Combi Drill, SDS Drill, Impact Driver, Hammer Drill or Drill Driver? The first thing you need to decide is what sort of drill do you actually require. Are you doing the odd bit of DIY where you will hang a shelf and maybe mount a TV bracket on a plasterboard wall? Or will you be drilling into masonry regularly, require higher amounts of torque to drive fixings into various materials? 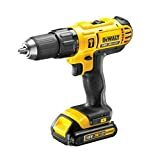 Starting with a drill driver, these are the entry-level basic drill, they are usually lightweight, cheap to buy and great for the simplest of tasks. Drilling wood and plasterboard is a breeze. These drills are great for the novice or someone who doesn’t have many requirements from a drill. Secondly a hammer drill, these are great as a heavy duty drill, not as lightweight or multi-purpose as a combi drill. However, very useful if your main goal is drilling concrete or masonry. An SDS drill adds to the power of a hammer drill and then some. This has lockable bits with no chuck key required, it holds the bit in place whilst hammering through the toughest of materials. SDS drills also offer typically a chisel action which is great for breaking down masonry or concrete. We have used the chisel action to channel sections of a wall out for burying cables, it works a treat. Impact drivers are a personal favourite of ours and you can see our review of some of the best impact drivers for more information. These are the tool of choice should you wish to drive fixings straight in without the need to drill pilot holes first. The combination of a clutched gearbox and high torque makes them perfect for the job! But in our opinion, one of the best drill choices you can make is the combi drill. That is why we have put together our best cordless combi drills review for you. The reason being they have a great amount of torque to drive fastenings in just like an impact driver. They have a standard drilling option like a drill driver, whilst having a built-in hammer function to take care of concrete and masonry. They don’t quite pack the punch of an SDS drill nor do they have the amount of torque available to an impact driver. However, as an all-around drill, they are fantastic! We would highly recommend one and read on to find out which we feel is the best cordless combi drill. The Bosch PSB 1800 LI-2 Hammer Drill is a cordless, 2-speed combi drill suitable for both standard and hammer drilling. 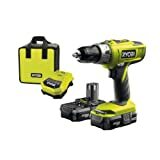 The kit includes a second 1.5Ah battery for extended drilling and Bosch’s standard 1-hour charger. We feel that the PSB 1800 offers great value for money and is a great addition to any tool kit. With a second battery, charger and plastic carry case, it is priced the same as some headless drills in its class. One of Bosch’s greatest offerings and this drill has it too, is the two-year manufacturer’s warranty. That gives you the peace of mind that the drill will keep on going. You can read the full review below. If a lithium battery gets too hot then you risk long term damage to the battery. If you require the use of the drill for extended periods of time then swap the battery over at regular intervals. Not only does this even out the wear on the batteries it also keeps them from overheating. Always avoid running a lithium battery down to zero – the moment you notice that your power tool starts to lose power, swap the battery with a spare. If you run the battery completely flat you risk damaging the battery and reducing its lifespan. Not only is it handy to keep batteries charged up and ready for use, repeatedly charging them up from flat will reduce the lifespan of the device. Makita 18 V Cordless Combi Drill, 2 x Batteries, Charger and Accessory Kit, 70 pc. The Makita Cordless 18v Combi Drill is a fully featured drill from one of the most respected manufacturers in the industry. The 13mm Keyless Chuck and smooth battery change make this one of the nicest to use of all the devices tested. We found that the Makita is very comfortable to use for prolonged periods. Battery swap out was also very smooth with none of the sticking associated with some of the cheaper brands. A standard 60-minute charger is included in the kit so you always know that your batteries are topped up quickly and easily. As with the other best cordless combi drills at this price point, the Makita is plastic bodied. Despite this it feels tough in the hand and is made from high impact plastics – you know this drill is going to last. The Makita also features a 13mm keyless chuck. This larger size makes changing bits easier and quicker than the standard 10mm versions. We found that you do get what you pay for, and the Makita is definitely on the premium end of the pricing scale. It’s nice and easy to use and feels great in the hand and if you can afford the little extra that the brand commands then you won’t be disappointed. The Bosch PSB 1800 LI-2 Hammer Drill is a c2-speed, 2 speed combi drill suitable for both standard and hammer drilling. We feel that the PSB 1800 offers great value for money and is a great addition to any tool kit. The PSB 1800 is designed around Bosch’s own Syneon chip to intelligently manage the application of power between the battery, motor and gearbox – in real terms, this means that you’ll always get the optimum levels of performance and endurance from the drill. It contains a second battery effectively doubling the run time for the drill with both 18v batteries being rated at 1.5Ah. The inclusion of larger capacity batteries would be nice; however, at this price point, the 1.5Ah offers the best balance between runtime and value for money. The kit includes Bosch’s standard 1-hour charger, which as you may have guessed charges the batteries fully in 60 minutes or less – we found that this was more or less spot on each time we charged up the unit – this gives you the confidence that you know how long charging is going to take. Although the body of the drill is plastic, it feels sturdy in the hand and should easily be able to handle the knocks and bumps it’ll pick up through everyday use. The drill feels comfortable in the hand and weighs in at a little less than 1.3Kg. We found this an ideal weigh as it gives you the confidence that the drill is going to handle those tougher masonry drilling jobs whilst still being comfortable to hold for extended periods of time. The drill also features other professional features such as an integrated work light which is extremely useful when drilling in low light environments. We think that the Bosch PSB 1800 LI-2 Hammer Drill is a great piece of kit, offers superb value for money and would be an excellent addition to any tool kit and we are happy to award it our best cordless combi drill. We have done a full in-depth review of the Bosch PSB 1800 if you want to know even more about its amazing features. The Black + Decker 18v Cordless Drill is a high-performance driver designed to be the cornerstone of your tool kit. The drill features a unique spring-loaded battery clip for fast, easy battery swap outs and a more secure fit between drill and battery and a handy LED work light for low light situations. One real downside of the Black + Decker is the slow 3 hour charge time of the included 400mA charger. While not much of an issue if you only have light uses planned for the drill. In a professional environment where you are looking for fast charging, this simply won’t cut it despite the inclusion of higher capacity 1.5Ah batteries. For this reason, it’s sadly out of the running for our best cordless combi drills. The Ryobi ONE+ Cordless Combi Drills is an exceptionally easy to use, premium drill thats full of useful features. The LED work light, magnetic bit holder and a one-handed bit change system make this a superb piece of kit – and one that is well worth the small premium that it commands. Like other premium combi drills in this review, the Ryobi features a 13mm keyless chuck but with an automatic spindle so you can perform bit changes single handed (this is a far more useful feature than it initially sounds). The drill features an advanced planetary gearbox, reducing the weight of the device as well as increasing reliability when under load. Other features include a magnetic drill bit holder and an LED work light. The drill is certainly not without the power to get the job done. The drill features 24 different torque settings with a maximum torque output of 50Nm. A fast 45-minute charger is also included as part of the kit as well as a sturdy hard case. Because the Combi Drill is part of the ONE+ range, the batteries are compatible with 35 other Ryobi devices. Larger capacity batteries are also available for extended drilling applications. We found the Ryobi ONE+ Cordless Combi Drill to be a great work tool, like other premium branded tools you do get what you pay for and if you already have invested in some other tools in the ONE+ range, then this is a no-brainer. The Stanley FATMAX 18v Combi Drill is a well rounded and solid feeling drill that feels like it will be able to withstand the knocks and bumps that it will inevitably receive during day to day use. It has a number of useful advanced features such as an LED work light, single-handed bit change, an integrated bit holder and a lightweight design. The unit also ships with a sturdy hard case for storage. We found that the Stanley was very easy to use in day to day situations but the slower 80-minute charger did let it down somewhat. If the unit was supplied with a faster 60-minute charger then this would have been the one to recommend as our best cordless combi drills. Having reviewed what we consider to the best cordless combi drills available from big manufacturers such as Bosch, Makita, Stanley, Black + Decker and Ryobi and we think we have found the best all-around recommendation. We believe that the Bosch PSB 1800 LI-2 Cordless Combi Drill offers the best combination of price to performance of all the devices featured. We will admit that it does omit some of the nicer features found on some of the more premium offerings, such as single-handed bit changing or the larger chuck size, but the unit is also far cheaper to purchase, potentially unto 40% less than some of the others. If you are looking for a solid, occasional use combo drill then you can’t go far wrong with the Bosch – we consider it to be the best cordless combi drill of the moment. The Bosch PSB 1800 LI-2 Hammer Drill is a cordless, 2 speed combi drill suitable for both standard and hammer drilling.